Thanksgiving is one of the most enjoyable holidays of the year. However, it also is one of the busiest, and thousands of people throughout the United States travel via motor vehicle to celebrate the festive occasion with friends and family. Tragically, the increased amount of drivers on the road, as well as late-night and drunk driving, contributes to an increased number of car accidents during the November holiday. The Law Office of Neil Burns can help you understand your legal options if you’ve been in a motor vehicle accident over the holidays. An overwhelming number of Americans travel during the Thanksgiving holiday. In fact, according to the auto club AAA, 90 percent of travelers in Thanksgiving of 2012 made their trips via automobile. And, according to a 2009 article published in Forbes Magazine, the Thanksgiving holiday is the most dangerous holiday of the year; more dangerous than even New Year’s, which is often regarded as being a prime time for drunk drivers to hit the road. 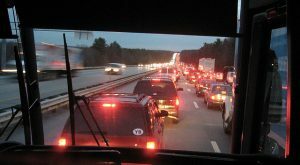 The same Forbes article states that the average Thanksgiving driver will travel 214 miles. Additionally, many driver drive at night in order to reach their destination, which leads to impaired vision and driver fatigue – two dangerous factors that are often the cause of motor vehicle accidents. The numbers regarding the number of accidents and injuries during the Thanksgiving weekend are harrowing; according to a 2013 Consumer Advisory published by the National Highway Traffic Safety Administration, there were 416 motorists killed in traffic crashes during Thanksgiving weekend in 2012. Of these 416 deaths, 60 percent of the victims were not wearing their seatbelt at the time of the collision, and an overwhelming 42 percent were killed in an accident that involved a drunk driver with a blood alcohol content level of .08 or higher. In the United States, a person is killed by a drunk driver every 45 minutes; during the Thanksgiving holiday, the number of those who choose to drink and drive is high, and the risk of being in an accident involving a drunk driver increases. Who’s liable for a car accident in Massachusetts? Nothing can ruin your holiday faster than a car accident, especially one that results in serious injuries for yourself or your passengers. If no serious injuries have occurred, then your insurance company is responsible for paying damages. However, if injuries involve medical bills over $2,000 or a broken bone or scarring, then you can file a claim against the other driver’s insurance company. Most claims don’t go to court. You will have to show that the other driver was negligent and that the negligence caused your injuries. If this can be proved, you can recover damages for your pain and suffering, medical expenses, lost wages, and more. At the Law Office Burns & Jain, we know how life changing a serious car accident can be, and that’s why we’ll fight hard on your behalf. If you need help filing a lawsuit for damages, call our team now at 617-227-7423.